Home/Out of Africa/2008/Let There Be Light! 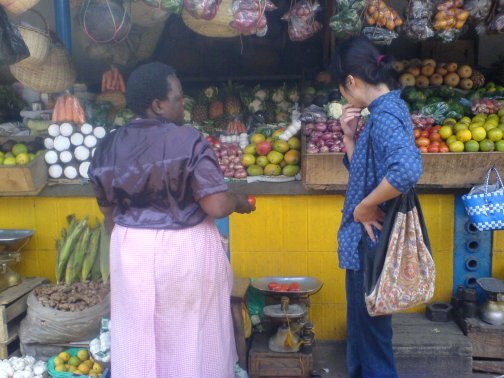 Just off Kenyatta Avenue in downtown Nakuru is the Top Market, a delightful assembly of fruit and vegetable stands interlaced with hand-made baskets, tobacco, and spices. At it’s center is stall #169 where the Morokoshi Juice Bar serves an uncommon array of fruit smoothies. Promoted in a fashion familiar to those in the Western world, this Kenyan original offers concoctions made from mango, passion fruit, papaya, banana, orange, lemon, avocado, and sugar cane. All are made fresh on the spot with the use of electric blenders, served in clean glass cups. Stephen Muriithi, Top Market chairman and owner of this fruit stand has broken the commonplace repetition of selling the same thing, stall after stall. 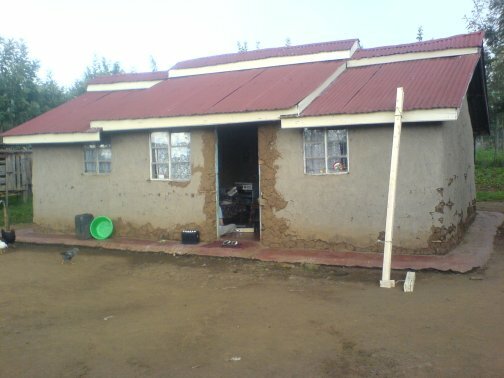 Instead, with the assistance of his sister and dedicated staff, he has combined his two years university education in the Culinary Arts and Health with an innate business sense to not only run a successful fruit and juice stand, but to also fund a nursery and kindergarten school on his farm land, just outside of Nakuru. 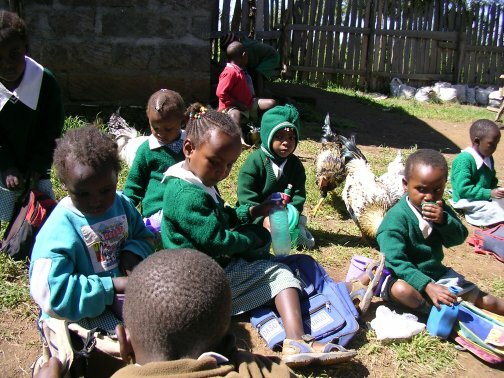 Initially motivated three years prior by the enthusiasm of a Japanese tourist who volunteered at Steve’s fruit stand, Steve’s vision for a holistic school in the rural farmland was given form. 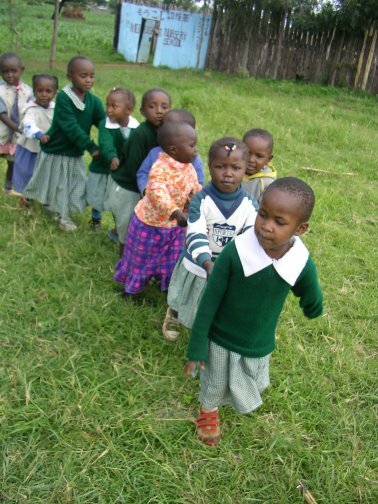 The following year, another set of Japanese tourists were moved to help him and initiated the Nakuru Family Project. And this year Japanese SPAN volunteer Rie Haga serendipitously found Steve, the fruit stand, and the Morokoshi School. 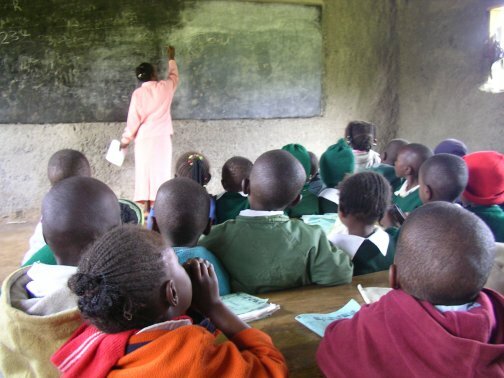 The first classes were held in the living room of Steve’s humble mud wall home, the concrete floor serving a dozen children. 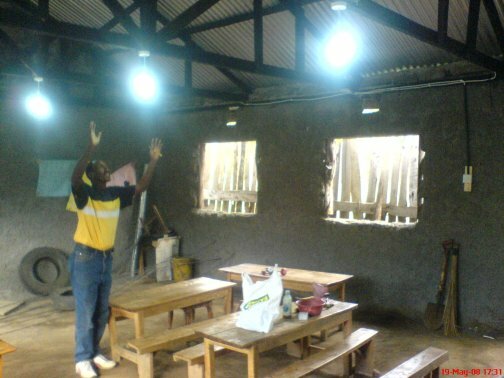 Construction of the first classroom, also a mud wall building currently without door, wooden frame nor glass for windows, was completed just last year. A second building on adjacent, rented land serves as the kindergarten classroom and orphanage for two children without parents. Now, in its second year of operation, Morokoshi (from the Japanese word “tomorokoshi” for “sweet corn”) is a center of enthusiastic learning for fifty pre-school and 25 five to six year old children who walk as far as a few kilometers every morning. They carry backpacks or shoulder bags with notebook and lunch, arriving between 6:30 and 7:30 am, class starting promptly at 8:00 am. SpanAfrica Director Cameron Dunkin met Steve just before the school opened, in 2005, and has maintained communication with him since. Cameron worked this spring with Morokoshi teachers to share his formal experience with teaching methods and materials. SPAN is pleased to have Morokoshi as a Partner Project site and welcomes new volunteers to work with Steve, the teachers, and students in this beautiful, rural setting. 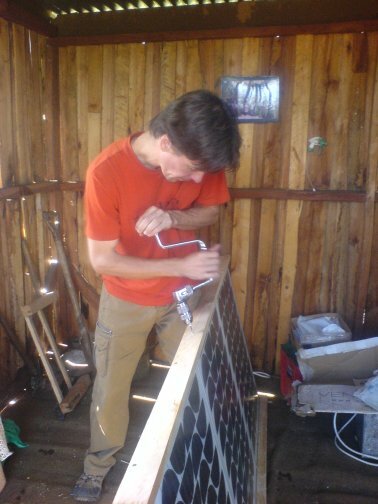 Last year my former high school physics professor Dan Heim, from Brophy College Preparatory in Phoenix, Arizona, donated eight photo voltaic solar panels, used originally to power Dan’s water pump at his New River home. Beneath the car port of my parent’s home in Phoenix, my father and I built sturdy wooden shipping crates which served well in safely transporting the panels to Nakuru last year. As a kid, I played with basic electrics, disassembling my parent’s alarm clock and pocket calculator to build a simple remote controlled car or robotic arm; some powered by batteries, some by solar panels. Having built one and remodeled two homes and worked closely with the electrical engineer who built-out the 3000 sq-ft high performance computing facility for Sony in the summer of 2006, I am confident with my electrical wiring. But a completely self-contained power generating station was new territory for me, and so I asked Dan to guide me through the basics of solar system design. He delivered an email which I translated into a spreadsheet to calculate the number of run-time hours based upon the quantity and power of PV panels, quantity and capacity of batteries, conversion to 110V or 220V A/C, system efficiency, and appliances attached. The first evening at Morokoshi, we filled the new battery with fresh acid, nearly topping off each cell with one bottle each. I then began instruction for the use of a multi-meter to test voltage. 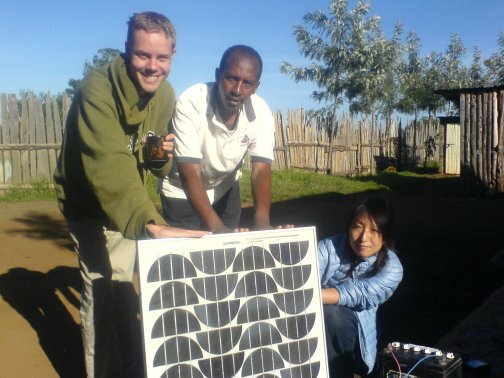 We also connected the inverter, my laptop, and Steve’s cell phone to demonstrate the basic function of the system. It worked flawlessly! 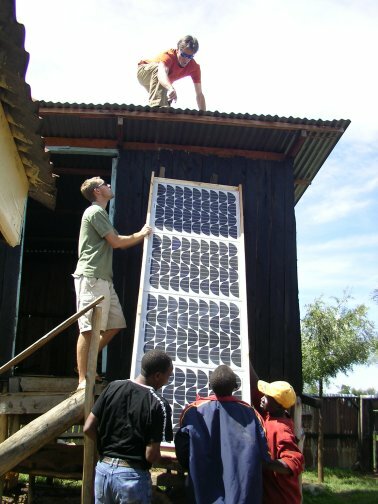 The next morning we dove into the design of the wooden frame which would hold the panels and secure them to the corrugated roof of the office, located neatly between the house and school. 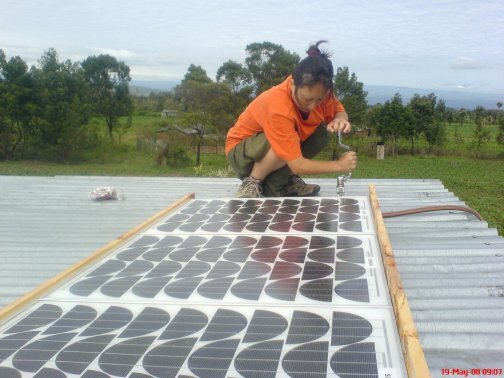 The frame needed to be ridged, shed water, and enable air flow beneath the panels to keep them from overheating (which reduces the effective conversion of sunlight to electricity, the potential thermal difference a significant factor in the potential electrical difference from silicon semiconductor to conductor backplane). Steve, Cameron, Rie, and I walked three or four kilometers to the local lumber yard. After some seemingly complicated communication over a relatively simple order, we were granted freshly planed timbers which I cut to length by hand during a power outage. 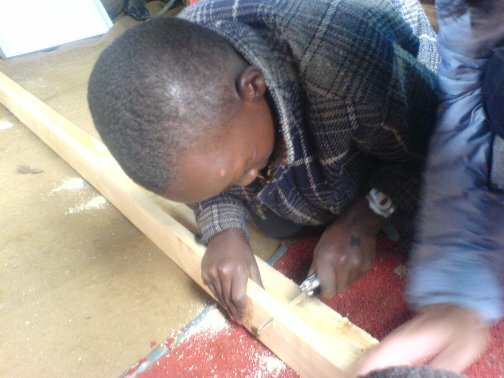 We carried the lumber back to the school, on foot, and after lunch rapidly built the wooden frame and secured the panels with two screws each. With the help of a local boy Brian, maybe eight years of age) and his younger brother, and through the loan of a good bit-n-brace and handsaw by a willing neighbor, we managed to get the frame completed in just one full day. 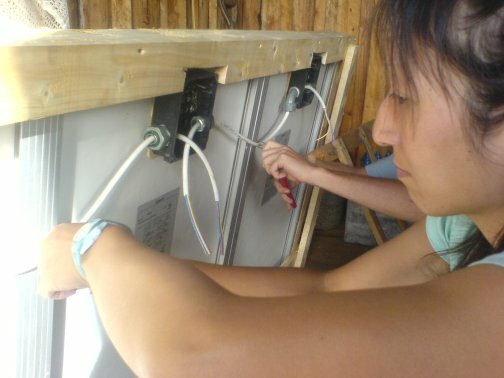 I showed Steve, Cam, and Rie how to wire the panels in parallel, maintaining 12V D/C but increasing the Amperage. Steve, Cameron, and I located the ideal position for the batteries in the office, built a shelf, and then mounted one of the masonite panels (from the shipping crates) to the wall, a clean slate for the power management station. The next morning, we hoisted the frame and panels to the roof and ran the wire into the office through the gap between the roof and the wall. 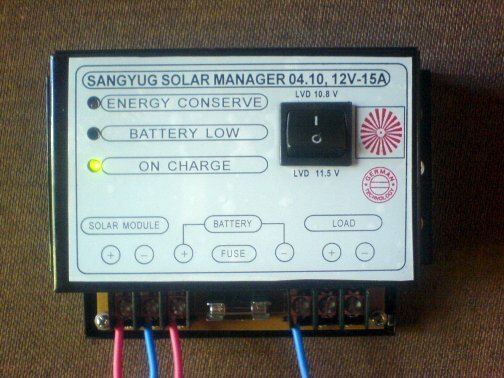 The system came together nicely, the charge controller performing its functions of both monitoring the low and high voltage of the batteries while determining when to pass power from the panels directly to the inverter or to charge the battery, or both. Steve was a quick study, eager every morning to enter the office and learn that even as early as 6:30 am, the charge controller’s green LED signified that the batteries were charging. Less than ten kilometers from the equator, at greater than 5,000 feet elevation, the cool nights are met with early sun and a good ten hours of charge time each and every day. Even during the afternoon rains the panels were in fact generating some electric flow, ample to satisfy the charge controller. In the course of just five days, two with the assistance of Cameron before his return to Canada, Rie and I wired the entire school and office. 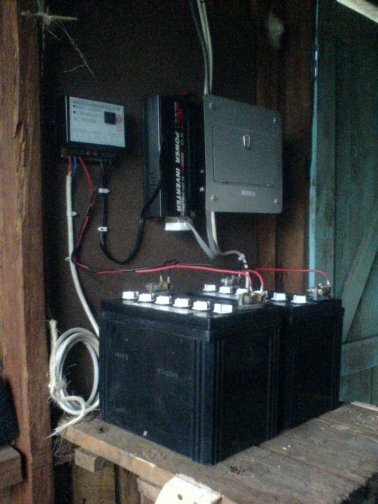 We included a proper breaker box (called a “consumer” in Kenya) so that as the system grows, and the inverter provides not just 300W, but 1200W, eventually 2400W and the appliances draw more power than that of a cell phone charger or light bulb, the system is able to accommodate. I chose the higher Wattage bulbs (over the more common 11W units) for their softer light, a glass shell around the otherwise harsh, naked tube. The spreadsheet showed that even when we doubled the energy consumption, the 200W generation at just 6 hours each day into 100 Amp-Hours of batteries more than compensates for two, maybe three hours of lights each night. Download a spreadsheet to help design a Grid-Tied or Off-Grid solar PV generation system, including a calculation of Return On Investment (ROI) calcuation for Grid-Tied systems. These spreadsheets are the result of a foundation initially developed as an educational tool while at Morokoshi in the spring of 2008. Ultimately, it is Steve’s goal to gain donation of one or more computers so that he may grant his young students a more comprehensive learning environment with interactive DVDs, educational documentaries about their own and foreign countries, and basic computer skills. He is currently researching how to bring the internet to his rural school, via satellite or cell phone. Those five days at Morokoshi were days that gave me a true sense of calm, a needed balance to the failure in negotiations with Pistis to bring an end to corporal punishment. I found a place in my heart where I truly believed in the work I was conducting. 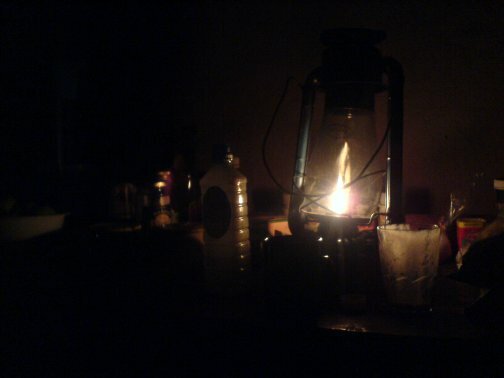 And I found I was more comfortable talking and eating by kerosene lantern in Steve’s mud home than in the four-star hotels in India just three weeks prior. I needed nothing more than those basic comforts, bringing me back to my childhood on a farm in rural Iowa. I have spent my adult life seeking, striving for those moments when life just pauses, when time is no longer important and there is a sense of belonging to the moment more than it belongs to me. I have experienced this a few times in my life, when backpacking, climbing, and laughing with friends while hiding from the rain beneath a boulder at 10,000 feet; when playing piano, painting Christmas cards by firelight, sharing deep breaths with my lover, and just recently, an evening at Morokoshi, Kenya. On a particularly cool, crisp night, the kerosene lamp illuminated the interior of Steve’s mud wall home while outside the stars overhead were nearly as bright as when I was a kid on my grandparents’ farm. Cameron and I sang to the musical Rent which played on my Sony-Ericsson Walkman. Steve’s companion and her assistant cooked in the kitchen over a coal stove while Steve studied the owner’s manual for the charge controller, and sleep found Rie while she sat upright on the sofa. I remember when I was impressed with the sensation of capturing that moment. It settled into my body the way a cat curls up on your lap and falls into a deep, safe sleep. I looked around the room and experienced everything in a freeze-frame, just for a moment, as though someone had flipped a switch. Life paused. And I paused with it. By day Steve’s radio was tuned to the local EZ station which played ’80s love ballads and soft rock. Phil Collins, Air Supply, and Fleetwood Mac accompanied the lunch time pleasure of ugali and greens or a simple noodle dish always accompanied by chai (hot tea, fresh whole milk, and cane sugar). The sheep cried for attention and the chickens walked in and out of the living room, cleaning the floor of those morsels which fell from our plates. These are memories that will last a lifetime. Thank you Steve, Cameron, Rie … and Morokoshi.